He arrived in Dubai just as the UAE came into existence. He started working at the Dubai airport in a time where there were no computers and this town was nothing more than a stopover for flights on their way somewhere. In his 37 years as a Dubai resident, KJ Bhatia raised a family, developed a career, and enjoyed a front row seat to see a world of change in both the city and the region. 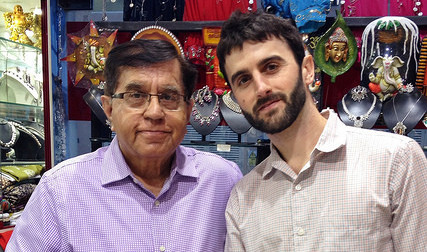 As luck would have it, one day as I was shopping for postcards, we struck up a conversation in his shop which would eventually lead to this podcast. This is one man’s story, a rare voice of experience, that runs parallel to the story of a nation. One of my favorite voices from Dubai, Mr. KJ Bhatia.